Fresh garlic adds flavor to soups, casseroles, stir-fries, mashed potatoes, roasted vegetables, pork, chicken, and many other dishes. Few garlic lovers can pass up a head of fragrant, roasted garlic spread on crusty French bread. And, for the truly adventurous, there are cocktails made with a bit of garlic. If you enjoy cooking and gardening, September is the time to plant this pun-gent edible. 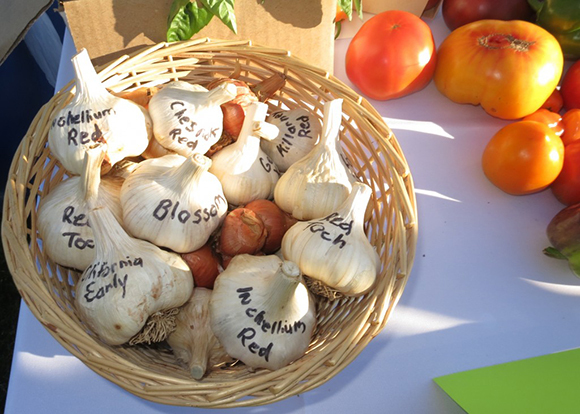 Find a host of garlic cultivars for your garden online. Garlic is a member of the genus Allium, which includes chives, onions, shallots, and leeks. It’s an underground bulb (also called a head) made up of 8 or 20 cloves depending on the variety. There are many different garlic cultivars, but the soil, water, location, climate, and other factors can influence their flavor and the color of their papery wrapping. Elephant garlic, found in stores and garden catalogs, is not a true garlic, but a type of bulbing leek. 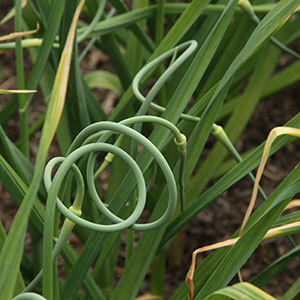 Snap off curly scapes in spring and use as you would use garlic cloves in your cooking. Garlic generally falls into two categories: hard-neck and soft-neck. Soft-neck garlic is named for its soft stem. It’s sometimes called silver-skin garlic in a nod to its white papery wrapping. This is the garlic that you’ll most often find in food stores. Each soft-neck head has 6 to 18 cloves packed in several layers and the heads have a long shelf life after harvest. Hard-neck garlic (Allium sativum ssp. ophioscorodon) produces heads with 5 to 10 large cloves that grow in a single circle around a central woody stem. The cloves range in flavor from mild to strong and spicy. 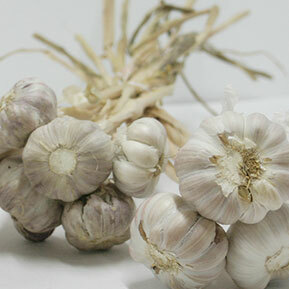 Hard-neck garlic is very cold-tolerant but has a short shelf life once harvested. Hard-neck garlic also produces a stiff flowering stalk, called a scape, topped with bulbils (tiny bulbs) instead of seeds. Chopped and tossed into a stir-fry dish, the scapes add a hint of garlic flavor and aroma. You can purée the scapes for pesto and use them on pasta. Choose a spot with six or more hours of full sun from spring through summer. Plant the cloves in fertile, well-drained soil, placing them 3 to 4 inches apart and 2 to 4 inches deep. Keep the cloves watered during dry weather in fall and again in spring and summer. Dry soil results in smaller heads of garlic. After planting the cloves this month, they’ll send up a few leaves while they send down the first roots. The first hard freeze usually kills the young leaves but they’ll reappear in March or April. When the weather warms in spring, feed the plants with a nitrogen-rich fertilizer, fish emulsion, or manure tea once a week between regular watering. The scapes appear in late spring. Snap them off with your fingers when the stalk is young and curly and about a foot long. By summer, the leaves begin to turn yellow and fall over—a sign the garlic is dry and ready for harvest. When the leaves start to yellow, stop watering the plants. In the Chicago area, harvest time is usually in July. Use a spading fork to loosen the soil around the outer edge of the rows. If you try pulling the bulbs out of the ground instead of digging them out, the leaves will break off. Brush the soil from the bulbs and roots but don’t wash them. Dry the heads for about a month in a cool shady place with low humidity and good air movement. For best flavor, don't refrigerate garlic. Freshly harvested heads of garlic contain cloves that are moist and have a mild flavor. The cloves eventually become dry and their flavor intensifies to a spicy-peppery zing, and they send up a green shoot that can be very bitter, especially when raw. When that happens, cut the cloves in half and remove the green shoot. Don’t refrigerate garlic, but do store it in a cool area where there is some air circulation. A kitchen countertop is likely a better choice than inside a cabinet or pantry. If you enjoy garlic, you’ll love roasting it and spreading the buttery cloves on fresh bread. Roasting brings out a silky texture and a mellow soft taste. Slice off the very top of the garlic bulb (about 1/2 inch). You can set it aside and use that bit of raw garlic in another recipe. Place the garlic heads on a sheet of heavy aluminum foil. (If you use a lighter-weight foil, double it so the oil won’t leak in the oven.) Drizzle a teaspoon of olive oil over each head and loosely wrap the foil over them. Carefully open the foil packet to let the garlic cool. Squeeze the soft cloves out of the papery skin and spread on fresh bread. You probably won’t need butter. Yum! Gently muddle the garlic in the bottom of a shaker. Add ice and remaining ingredients except for ginger beer. Shake. Strain into a highball glass filled with ice. Top up with ginger beer, stir and add garnish. Join professional culinary instructor Mary Kay Gill in the ITW Kitchen Classroom, Learning Center. Visit our Plant Information Service and find information on common pests and problems, and more. If you wish to submit insects for identification to Plant Information, complete this inquiry form. Note where the insect was collected, the plant on which it was found, and whether it was indoors, outdoors, etc. Submit your specimen in a crush-proof container, preferably one that’s clear and can be sealed.